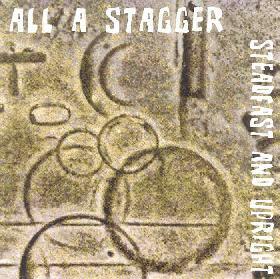 All A Stagger - "Steadfast And Upright"
All A Stagger is Clive Richards from Fragment music and whoever happened to pop on by the Dog Kennel Studios in Essex, England between 1998 and 2000. All tracks were recorded live. "Slip and Slide" is a slow, loungy number with some reggae undercurrents, while "Get Down", is a groovy, funky jam with a cool groove and some cool didgeridoo. These guys were getting down!!!!!!! "Don’t Go" is a sort of 60s style psychedelic song with a cool organ line but there is also a sort of stoned dub groove hiding underneath. The mix on these tracks is quite strange as the guitars are pretty far in the background as is the keyboards, while the percussion is really up front, as are the vocals. It gives it a special “live” sound. "Depths of Despair" is an instrumental jam. "Ship of Fools" has three guitar players and the first track on the CD without synthesizers. The track has a slow fade suggesting this is only part of a longer spaced out jam. This song builds up another funky Santana-ish groove. Another faded in track that is part of the most spacey piece on the CD, with floating synths layering in the background and a cool guitar lead. Spaced out! "It’s Paradise" closes this quite excellent set of experimental jams. The band have another CD due out soon. For more information you can visit the Fragment web site at: http://www.fragmentmusic.com. Contact via snail mail c/o Fragment; PO Box 4063; Brentwood; Essex; CM14 4WH; England.